"A Summer Blizzard" played to rather poor business at the Lansing last night. The company possesses two very clever dancers in the Nichols sisters and a Hercules jr. who can neither act, sing nor dance in Henry Putman . H. W. Murphy did the crushed tragedian with a silent and impressive dignity which suggested the melancholy Dane and was a restful contrast to the loud-mouthed, full-fisted methods of the rest of the company. His thin and flowing locks, his chin, blue-black from constant shaving, recalled the Shakespearian actor all too forcibly. He was a Thespian to the finger tips, which were constantly appearing through his shabby gloves. In the last act Barnaby Reynolds did some clever imitations. That is a complete and charitable invoice of the good attributes of the company. An itemized account of its failings would be longer and more tedious. "The Summer Blizzard" is the work of a man who believes that a company and a little scenery and considerable nerve are the only requisites for a play. If there is any evil in the Hoyt school of farce it is that the opinion has gone abroad that a little horse play and half a dozen songs are all a play really needs. The play is loosely written and coarsely acted. There is not a man in the company who is not knocked down in the first act and kickeddown stairs in the second. The comedy is all of a crude, clownish sort that hinges on sounding blows and the physical degradation of the actors. It is a pity, for the most of them seem to be bright young people and deserve a better play. This one could only run successfully in Zululand or the Cherokee strip or among the cannibals of the upper Congo. Miss Clara M. Richardson entertained a company of about two hundred of her friends with a song recital in the parlors of the Windsor last evening. She was assisted by Mrs. Will Owen Jones in two piano numbers and by Miss Marie Hoover , accompanist. The leading musicians of the city were present, together with the best-known lovers and patrons of music. Their appreciation of the program was expressed in unmistakably hearty applause and by many compliments showered upon the performers in the social hour following the recital. Miss Richardson sang Donizetti's "La Zingara," Ehlert's "By the Beehive," "Solveig's Song," by Grieg ; "Salve Regina," by Dana ; Handel's "Let the Bright Seraphim," Neidlinger's "Robin" and "Spring Song" and the polacca from "Esmeralda;" by A. G. Thomas . This attractive program was lengthened by two encore pieces, the familiar "I've Something Sweet to Tell You," and a charming souvenir of country life, "The Wooing," by Martinus Sieveking . Miss Richardson has a fine high soprana voice, fresh and brilliant. Her style of singing has broadened since her last recital. The Handel number gave evidence of high ambition and ability to make its gratification possible and pleasurable. Her voice and manner also fit her for ballad singing. There was a wide range in her program, but she proved herself equal to all its exacting requirements. Miss Richardson had the advantage of a sympathetic accompanist. This difficult work was performed admirably by Miss Hoover. The piano numbers by Mrs. Will Owen Jones were Liszt's "Tarantelle" and a group of dainty things, "Morgenstimmung," by Grieg, "Krakowiak," by Paderewski , and "Eglogue," by Raff . "Gay Butterflies," by Louis Gregh , was added in response to an encore. Her playing was characterized by a fine appreciation of the poetry in the music and a marked delicacy of touch. 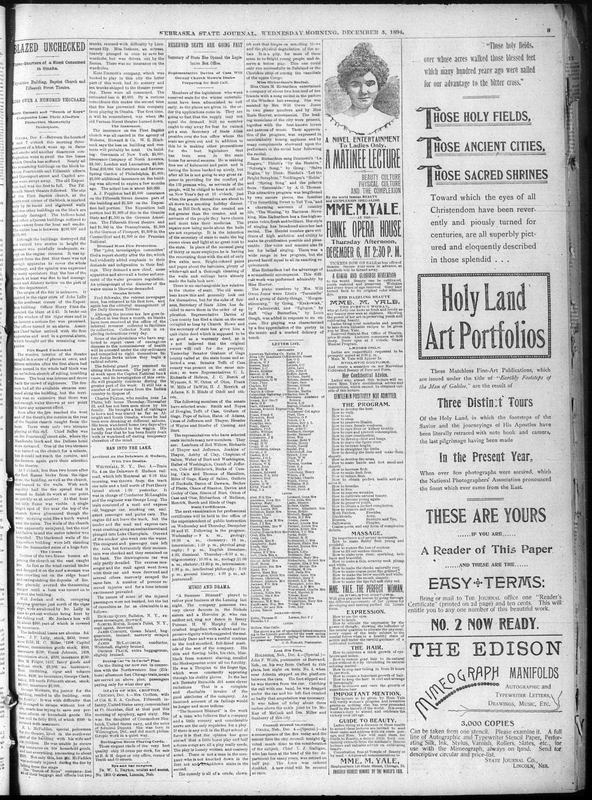 "A Summer Blizzard": Neither the New York Times drama review index nor Odell's Annals of the New York Stage notes a play of this name appearing in New York, although the Times records a performance in Philadelphia in September 1894. Cather reviewed the play on December 5, 1894. 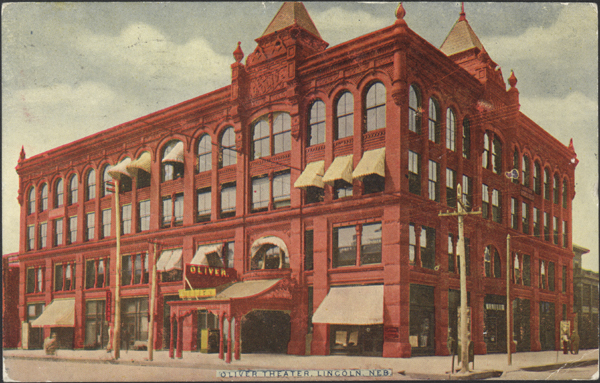 Lansing Theatre: The Lansing Theater, on the southwest corner of 13th and P Streets, was built in 1891, displacing the Funke Opera House as the largest and finest theater in Lincoln. The owners were J.F. Lansing (b. 1842), a Lincoln real estate man, and his brother-in-law Henry Oliver (b. 1857); Edward A. Church was the manager. According to the program of the opening week (November 23-28, 1891) the auditorium consisted of the orchestra and parquet seating on the main level, with dress circle at the rear and sides; three tiers of five boxes each and six loges were at the sides. Above were the balcony and the gallery. With standing room, about 2500 people could be present. The building also housed offices, including that of Cather's friend and fellow reviewer, Dr. Julius H. Tyndale. It was renamed the Oliver Theater in 1898. The Oliver Theater, Lincoln, Nebraska. The theater was originally named The Lansing Theater. the Nichols sisters: The New York Times noted that Lulu and Mabel Nichols "blacken their faces and appear as very frank darky girls" in Hendrik Hudson (20 March 1894); Odell notes their appearance in blackface in vaudeville in June 1894 (XV 608), and they continued to appear in vaudeville in the early years of the twentieth century. Sheet music for an 1897 song, "Mr. Morton, Stop Your Courtin'" noted that it was sung by the Nichols sisters. Hercules jr.: Hercules junior was a generic term for a strong man, or someone of such pretensions, after the hero Hercules of classical mythology. Henry Putnam: Neither the New York Times drama review index nor Odell's Annals of the New York Stage notes an actor of this name appearing in New York. H. W. Murphy: Neither the New York Times drama review index nor Odell's Annals of the New York Stage notes an actor of this name appearing in New York. the melancholy Dane: Hamlet, prince of Denmark. Barnaby Reynolds: Possibly the Barney Reynolds who appeared both in variety and vaudeville shows and in such plays as The Hustler (1891 and 1892), Fatherland (1892), and Chimmie Fadden (1896). Charles Hoyt: Charles Hoyt (1860-1900) was born in New Hampshire, moved west to a cattle ranch in Colorado, became a newspaperman, then wrote his first play and had it produced in 1883; he became one of the most successful producer-playwrights by the late 1880s, perfecting the style of Broadway musical in which a farcical, light-hearted plot gives opportunities for songs and specialty features. Hoyt school of farce: Hoyt's plays, and their imitators, were comedies with very loose, though sometimes complicated, plots interspersed with songs, dances, and specialty numbers. Zululand: The Zulu king Shaka (d. 1828) established a great kingdom in southeastern Africa. His successors resisted attempts at conquest by the Boers, and were at first able to resist the British in the Anglo-Zulu war of 1879. However, by 1887 Zululand had been annexed by the British, becoming part of Natal in 1897. Cherokee strip: The Cherokee Strip in Oklahoma was an area 226 miles long (east to west) and 58 miles wide, originally given to the Cherokee tribe when they were forced from Georgia to northeastern Oklahoma; it was known as the Cherokee Outlet, as the Cherokee were allowed to cross it to their hunting grounds further west. In 1866, the US government forced the Cherokees to sell tracts of the land to other Native American tribes. In 1893 the area was opened to white settlement, precipitating the last great land rush, as 100,000 people gathered to lay claim to 42,000 parcels of land. upper Congo: The great Congo River of central Africa was the last to be explored by Europeans; a series of falls surrounded by impassable terrain for more than 200 miles prevented explorers from approaching from the river's mouth on the west coast. In 1867, Henry Stanley, coming overland from the east, found missionary Dr. Livingstone exploring a river which turned out to be the upper Congo, above the falls. However, there was little European interest in the area until the late 1870s, when Leopold, King of the Belgians, decided to claim the area by means of a front company in which he was the sole shareholder. His ruthless exploitation of the resources and people of the area became notorious. Miss Clara M. Richardson: The 1892 Lincoln city directory lists a Miss C. M. Richardson, whose residence was the Windsor Hotel, the proprietor of which was F. G. Richardson, presumably her father. the Windsor: The three-story Windsor Hotel in Lincoln, Nebraska, was built in 1884 by T.F. Barnes on the southeast corner of 11th and Q Streets. It was one of the larger hotels in the city, accommodating about two hundred guests. F. G. Richardson was the proprietor in the early 1890s. Image available at the Memorial On-Line Library of Historical Publications. Mrs. Will Owen Jones: Edith Doolittle, who attended classes at the University of Nebraska, married classmate Will Owen Jones (class of 1886). She was an accomplished pianist who performed at many public functions in Lincoln. Marie Hoover: The 1894 and 1895 Lincoln city directories show that Marie Hoover taught at the Lincoln College of Music and the Nebraska Conservatory of Music, and lived with her father, William H. Hoover, at 1336 L St. The 1900 census for Lincoln records that music teacher Marie Hoover was born in Nebraska in December 1871 to Ohio-born parents, while the 1880 census shows a 12 year old Nebraska-born Mary Hoover living in Brownville, Nebraska, with her parents, Ohio-born William and Harriett Hoover. Donizetti: Italian composer Gaetano Donizetti (1798-1848) was born in Bergamo and studied under Johann Simon Mayr, who recognized his talent early. His first opera was performed with some success in 1818, but he began to be well-known with the production of La Zingara in Naples in 1822, eventually establishing himself as the successor to Rossini and Bellini. He composed more than sixty operas as well as songs, chamber music, and church music. L'elisir d'amour (1832) is his most famous comic opera, Lucia di Lammermoor (1835) his most famous tragic opera. "La Zingara": Donizetti composed an "arietta" with words by C. Guaita, called "La Zingara" ("The Gypsy Girl") for solo voice and piano. In Donizetti's two-act opera, La Zingara (1822), the gypsy girl Argilla uses her opportunities as a fortune teller to save the life of the imprisoned Duke of Alziras, bring the lovers Ines and Fernando together, and free Don Sebastian—who turns out to be her father—from imprisonment. The soprano aria, "Fra l'erbe cosparse" is one of the more popular songs from the opera, which mixes spoken dialogue and musical numbers; the mezzo-soprano Argilla also has several arias. Ehlert: German composer Louis Ehlert (1825-1884) was also an influential teacher and critic who recognized and promoted the work of Brahms and Dvorak. "By the Beehive": "By the Beehive" is an art song (lied) by Louis Ehlert. Solveig: Probably one of Edvard Grieg's best-known works, "Solveigs sang" (also known as "Solvejg's Lied"), is from his Peer Gynt suite, no. 2, based on a text by Ibsen. It was first published in 1874-5 and revised in 1892 (op. 23, no.19). The song begins:The winter may pass and the spring disappear,The summer too will vanish, and then the year;But this I know for certain: that you'll come back again,And even as I promised you'll find me waiting then. Less often performed is "Solveigs vuggevise" (op. 23, no. 26). Edward Grieg: Edvard Grieg (1843-1907) was born in Bergen, Norway. A holiday in the mountains of Norway as a youth had a powerful effect on him, both in the folk music he heard and the landscape itself. The great violinist Ole Bull helped him enter the Leipzig Conservatorium in 1858; on his return to Norway he was influenced by Richard Nordraak and the idea of developing a national music. He became the best-known of Norwegian composers. Many of his compositions were songs, and his orchestral and piano works also have lyrical qualities. "Salve Regina": The Salve Regina is one of four hymns to the Virgin Mary sung in the medieval Latin mass; the words were traditionally attributed to St. Bernard of Clairvaux in the twelfth century, but are now thought to have been composed by Hermann Contractus. It begins:	Hail, holy Queen, Mother of Mercy,	our life, our sweetness and our hope. To thee do we cry, poor banished children of Eve;	to thee do we send up our sighs,	mourning and weeping in this vale of tears. At a performance of this piece at a concert of American music in 1891, the New York Times reviewer said, "There are no words at hand to express the disgust which C. Henshaw Dana's 'Salve Regina' inspired. It was a pitiable exhibition of puerile incompetency" (24 February 1891). Dana: American composer C. Henshaw Dana (1846-1883) studied abroad for many years, and composed both songs and church music; he died of heart disease at his home in Massachusetts. Handel: Composer George Frideric Handel (1685-1759) was born in Saxony, and showed his musical talents at an early age. His first two operas (of more than fifty written in his life) were produced in 1705, when he was twenty; when opera was banned locally, he turned to composing sacred music and oratorios. In 1710 he became Kapellmeister to Elector George of Hanover, soon to be King of England; Handel settled in England in 1712 and became a British subject in 1726, and was associated with the Royal Academy of Music, the Royal Opera House, and the royal court, for which his Water Music and Fireworks Music were composed. When he died he was given a state funeral and was buried in Westminster Abbey. Handel's operas lost favor in the nineteenth century, but his sacred oratorios, the most famous of which is the Messiah (1742), were often performed by both amateur and professional choruses. "Let the Bright Seraphim": In Handel's oratorio, Samson (1743), Samson's funeral pageant is followed by an exultant aria for trumpet and voice, "Let the Bright Seraphim." The words were taken from Milton's ode, "At a Solemn Musick:"	Let the bright seraphim in burning row,	Their loud, uplifted angel trumpets blow. Let the cherubic host, in tuneful choirs,	Touch their immortal harps with golden wires. Neidlinger: American composer William Harold Neidlinger (1863-1924) was born in Brooklyn; he became a student of organist Dudley Buck and later taught in the music department at the Brooklyn Institute of Arts and Sciences. He composed the music to an opera, Ulysses (1898), set Walt Whitman's poem, "Memories of Lincoln," to music, and composed the Christmas hymn, "The Birthday of a King" (1890), and southern dialect songs such as "Sweet Miss Mary" (1906), as well as more serious music such as the hymn "Spirit of God" and the cantata, Prayer, Praise, and Promise. "Robin": "Robin" is a song with words by Oley Speaks and music by W. H. Neidlinger. "Spring Song": W. H. Neidlinger wrote both the words and music to "Song of Spring." polacca: A polacca is a form of the Polish dance, the polonaise; this may be Esmeralda's song at the end of the first act of Goring Thomas's opera Esmeralda (1883). "Esmeralda": The four-act opera Esmeralda was first produced in London in 1883, and had its first performance in the United States in 1900. The story is that of Victor Hugo's hunchback of Notre Dame. A. G. Thomas: British composer Arthur Goring Thomas (1850-1892) studied in France and then at the Royal Academy of Music in London. He wrote two operas, Esmeralda (1883) and Nadesda (1885) and left a third unfinished at his death. He was best known for the art song, "The Swan and the Skylark" (1894). "I've Something Sweet to Tell You": "I've Something Sweet to Tell You" was the title of songs by several mid-nineteenth century composers to lyrics by Frances Osgood. However, in the 1890s it was one of the best-known songs by British composer Eaton Faning (b. 1850). "The Wooing": "The Wooing" was a song by pianist and composer Martinus Sieveking. Mr. Martinus Sieveking: Dutch composer and pianist Martinus Sieveking (1867-1950) was born in Amsterdam, where he studied with composer Julius Röntgen. He was a prolific composer, though many of his pieces are described as "salon music." However, he was also a talented arranger: many of his versions of Chopin's music are still standard. Sieveking taught at the conservatory of music in Lincoln from 1893-95, and toured America in 1895-96, performing at Carnegie Hall in New York. A tall, handsome man, he became a close friend of the famous strongman, Eugen Sandow (1867-1925), developing his body according to Sandow's principles. In the first quarter of the twentieth century, Sieveking taught piano in New York and composed and performed music for player piano companies. He died in Pasadena, California. Liszt: Composer and pianist Franz Liszt (1811-1886) was born in Hungary, of parents of German and Austrian descent. He began to play the piano at the age of six and soon showed himself to be a prodigy, making his first public performance at the age of nine. He studied under Beethoven's pupil, Carl Czerny, in Vienna; legend says that when Liszt played for Beethoven himself in 1823, the composer congratulated him and kissed him on the forehead. Liszt had a brilliant career as a virtuoso pianist, but retired from performing in 1847 to devote himself to teaching and composing. As both teacher and composer, he was one of the major influences on nineteenth century music. Liszt's younger daughter, Cosima (1837-1930) married composer Richard Wagner. "Tarantelle": Franz Liszt's "Tarantella," (a rapid dance from southern Italy in 6/8 or 3/4 time), was No. 3 of the "Venezia e Napoli" set in his suite, Années de Pélerinage, Second Year: Italy (1859). "Morgenstimmung": Edvard Grieg's Morgenstimmung ("Morning-mood") is from the Peer Gynt Suite, No. 1, Op. 46. "Krakowiak": Ignacy Paderewski wrote several krakowiaks for piano, based on a lively Polish folk dance in 2/4 time. There are two (No. 1 in E major, No. 3 in B flat) in Danses polonaises, op. 5, two more in Danses polonaises, op. 9 (No. 1 in F and No. 5 in A), both composed in the early 1880s, and a "Cravovienne fantastique," No. 5 in Humoresques de concert, op. 14, composed c. 1887-88. Paderewski: Ignacy Jan Paderewski (1860-1941), with his long red hair and commanding presence, became the type of the virtuoso pianist. His New York debut was in 1890, and he toured North America almost annually thereafter. "Eglogue": Joachim Raff published five eglogues in his op. 105, no. 3 (1865). Raff: German-Swiss composer Joseph Joachim Raff (1822-1882) showed early musical talent; he received a gymnasium education but was essentially self-taught musically. An early attempt to make a living as a composer bankrupted him, but encouragement by Mendelssohn and Liszt, and practical help from Liszt in finding jobs in the music industry—hack work like orchestrating waltzes by the hour—helped him make a better second start. In 1863 one of his compositions was awarded first prize in a Viennese musical competition, and thereafter he became a well-known, even popular composer, considered the equal of Brahms and Wagner. In 1877 he became director and professor of composition at The Conservatoire in Frankfort; there he taught and encouraged many younger musicians, including the American composer Edward MacDowell. "Gay Butterflies": "Les Joyeux papillons" (1877) was a "capriccio for piano" by Louis Gregh. Louis Gregh: French composer Louis Gregh (1843-1915) was born in what is now Algeria. He was a prolific composer of keyboard music for one, two, or three players, as well as songs and orchestral compositions, including ballets and operettas such as Un Lycée de jeunes filles (1881) and Le Capitaine Roland (1895). Gregh also began a music publishing business about 1876.